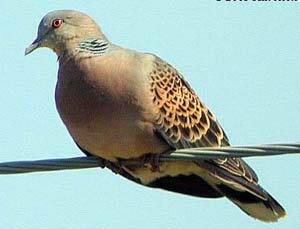 The Turtledove has a very sweet but mournful voice. his is a very beautiful and innocent bird, and no one is mentioned more frequently in the Bible. It does not live upon the flesh of animals: so when Noah sent one out of the ark, she soon came back again, because she could find nothing to eat, and no rest for the sole of her foot. Noah put out his hand and gently took her in, and she did not go out again for a whole week. Then Noah let her fly, and the beautiful creature came back in the evening, having in her mouth a green leaf which she had plucked from an olive-tree; as though she wanted to tell him that the waters were beginning to dry up. After another week she went out, and did not come back again to the ark, because the earth was dry. The dove was often offered as a sacrifice in ancient times; and was a type of our innocent Savior, to show how he would afterwards be put to death for the guilty. The Holy Spirit once condescended to take the form of a dove, when he rested upon Christ at the time of his baptism. Our Savior speaks of the innocence of this bird when he says to his disciples, "I send you forth as sheep in the midst of wolves; be ye wise as serpents, and harmless as doves." This bird has a very sweet but mournful voice; and this is referred to in the Bible. Hezekiah, one of the Jewish kings, had been very sick and expected to die; but as he lay on his bed, he prayed that God would be pleased to spare his life. God heard his prayer, and promised that he should live fifteen years longer; and soon after he became quite well. He was grateful to God for his goodness, and wrote a beautiful song of praise to be sung in the temple. Among other things he told how he felt when he lay so sick upon his bed. He says, "Like a crane or a swallow, so did I chatter; I did mourn as a dove." The turtle-dove is a bird of passage. It appears in Judea early in the spring, when the leaves are coming out, the flowers opening, and every thing looking lovely and beautiful. This will explain some verses in the Song of Solomon, "Rise up, my love, my fair one, and come away, for lo ! the winter is past, the rain is over and gone; the flowers appear on the earth; the time of the singing of birds is come, and the voice of the turtle (or turtle-dove) is heard in our land." It remains until summer is gone; and then flies away to a warmer climate to spend the winter. It is in reference to this that David says, "Oh ! that I had wings like a dove ! for then would I flee away, and be at rest; lo, then would I wander far off, and remain in the wilderness; I would hasten my escape from the windy storm and tempest." You will find these beautiful verses in the 55th Psalm. Who would not wish to be like the gentle, peaceful dove?